Biddy Early is a hybrid Marijuana strain that was specially developed to be cultivated in cold climates of the Eastern Europe. Highly resistant to fungi and moisture and interesting yields. Biddy Early is a hybrid sativa dominant Marijuana strain that was especially designed to be cultivated in humid and cold climates like nortthern or eastern Europe. Therefore, this specimen is highly resistant to fungi and moisture growing in a solid and vigorous manner, typical of sativas (it reahces heights of up to 2 meters) but flowering at an acceptable speed. Biddy Early's has a Christmas tree structure. From it you will harvest marijuana with a sweet caramel aroma, and when it is consumed it has a powerful and relaxing effect with hints of happiness, so it is not recommended for moments when you need to stay focused or to early hours of the day. With low temperatures, the plant will give us beatiful red tones, something that, by its culture features, almost always happens. 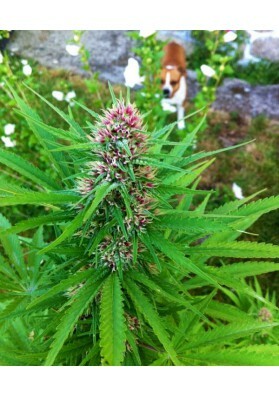 Despite being an ideal strain for outdoor growing, this plant will also offer you good outcomes it grown on the inside. In fact and in a growing room, it will give yields between 300-400 grams per square meter after 50-60 days of waiting. In the garden you should harvest it in late September or early October.